Photos obtained by Prison Legal News appear to reveal the bloody aftermath of a riot that occurred at the Lee Correctional Institution in South Carolina around 7:15 p.m. on April 15. The violence, which culminated in the deaths of seven prisoners, was the deadliest event of its sort in the past quarter-century in the United States. A source who requested anonymity and said he is currently imprisoned at the Lee facility in Bishopville provided PLN with a series of photos that appear to have been taken with a cell phone. The images show dead or badly-wounded bodies covered with blood and a blood-soaked floor. PLN could not verify the photos at press time, and our investigation into the authenticity of the graphic pictures remains ongoing. He also called on the Federal Communications Commission (FCC) to block signals from the cell phone tower located near the prison, saying that was something the Department of Corrections would be discussing with the FCC in the weeks to come. In April 2016, FCC Commissioner Ajit Pai visited Lee Correctional “to talk about the threat of contraband cellphones,” according to his Twitter account. Pai has long been a proponent of taking action to curb illicit cell phones behind bars, while also opposing lower prison phone rates that would undercut the black market for cell phones – a market that is typically supplied by prison employees in exchange for bribes. Rather than addressing the problem of corrupt staff members, corrections officials have focused on efforts to stop the flow of contraband phones. However, the source who provided the photos to PLN said cell phones were not actually at the center of the violent dispute, but rather other items that one gang faction said were stolen from the other. 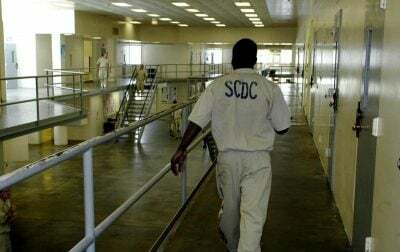 Another anonymous source who appears to be incarcerated at Lee Correctional Institution tweeted that SCDC officials at the facility “sat back” and let the fight escalate into a bloody and lethal riot, while watching and laughing. The Lee facility is a maximum-security prison, one of nine in South Carolina, with a checkered history of violence. Ironically, given the push by the SCDC and Governor Henry McMaster to jam cell phone signals in the vicinity around state prisons, the public release of images of the fatal brawl at the Lee facility would not have occurred were it not for the use of cell phones by prisoners. “They are using every excuse to get the phones blocked. Especially for situations like this where the news gets out before their PR team can make up a storyline,” said the confidential source. “Prison officials are trying to get rid of the only devices – cell phones – that prisoners can use to reveal abuses, abysmal conditions and misconduct by staff members behind bars,” noted PLN editor Paul Wright. “If a picture is worth a thousand words, then the photos of the bloody aftermath of the recent violence at the Lee facility in South Carolina speak volumes. The ability to document such incidents is what prison officials really want to prevent,” he added. SCDC officials did not respond to a request for comment from PLN about why prison staff took so long to respond to the fight at the Lee prison, nor did they disclose whether they have their own photos or video of the deadly incident. Six of the seven prisoners slain during the riot were black. According to the SCDC’s website, based on June 2017 data, blacks comprise 61 percent of the state’s almost 20,000 prisoners. Lee Correctional Institution is located in Lee County, which is named after Confederate general Robert E. Lee. WARNING: Graphic images are posted below. Note that these photos, reportedly of the aftermath of the riot at the Lee Correctional Institution, have not been authenticated. PLN is publishing these photos not for shock value or to exploit a tragic incident, but because we believe the public has a right to know what actually happens behind prison walls — a narrative that is usually controlled by government officials who are reluctant to disclose the abuses and failures within “correctional” facilities. This article was originally published on Prison Legal News.